It's been a pretty solid year for me this year, though I didn't post as much as previous years. It was a busy one, filled with firsts and awesomeness! Let's take a look! This year for for my family's Christmas party the elders decided that exchanging names and giving gifts was no longer the way we were doing things. Instead, we would be giving a $10 ornament and playing an exchange game. While I'm not a fan of this kind of thing, because it takes away the idea of picking something specifically for someone. At the same time if means that I don't have to struggle to figure out something and then worry if the person I was matched up with would like it or not. That said, as soon as I heard it was a ornament exchange, I knew what I had to do. Work on continues on the Admech army. I am really happy with the progress so far and its all starting to come together nicely. In the time since I started this project, the rules for the Friendly at Adepticon have been announced and one of the detachments allowed is Spearhead. In this detachment you field, at a minimum, an HQ unit and 3 units of Heavy Support. This changed my plan from fielding as many Vanguard as possible, to doing my dream army of a smaller force supporting a bunch of Kastelan Robots. One historical figure that I've always been interested in is Vlad the Impaler. I find the mixture of myth and truth to be really interesting and find myself reading about him from time to time. 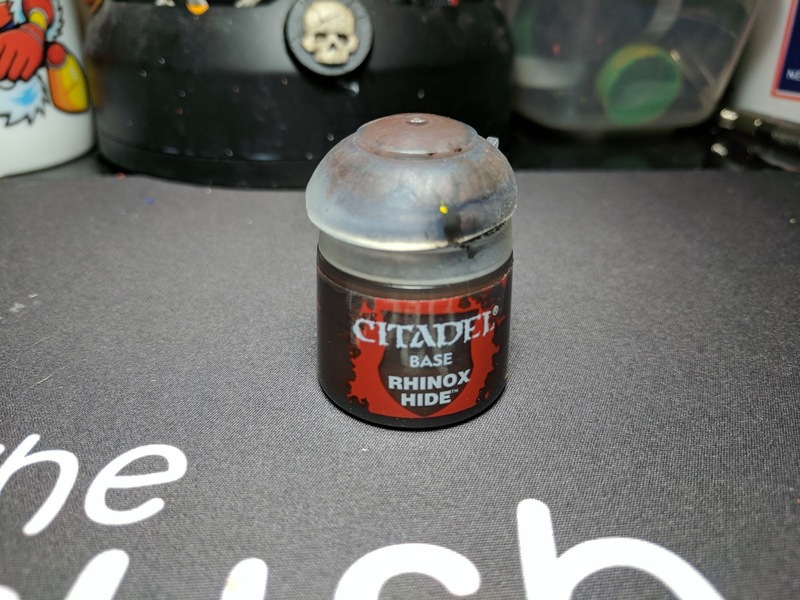 So when I saw Lyn of Metalhead Minis painting up a bunch of mini busts, which included one of Vlad, I instantly asked where to find him and bought one for myself. While working the Ninja Division booth at GenCon, I painted some German soldiers for their new line of WWII era minis, GUTS. I instantly fell in love with them and left with a Sherman tank and a squad of US HQ. I had big plans for them, but eventually they all went to the back burner. That is until I needed to find something to paint on stream, after I finished Vlad the Impaler. On a whim, I primed the Sherman and went to work on it. A few weeks before Halloween, I picked up some of Reaper's chibi Bonesylvanians. Lou, a chibi C'thulhu, Mel, a chibi mindflayer and Drak, a chibi man-bat. I decided to start with Lou and after looking him over for a bit I knew that I needed to model him after the larger C'thulhu that I painted a few years ago. 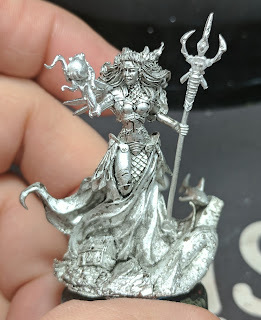 I'd picked up Marike, Guardian of the Sea from Dark Sword Miniatures about a month ago and had been planning to use her for something. I knew I wanted to put her on a display base, because she's such and excellent sculpt, but I wasn't exactly sure what I wanted to do. 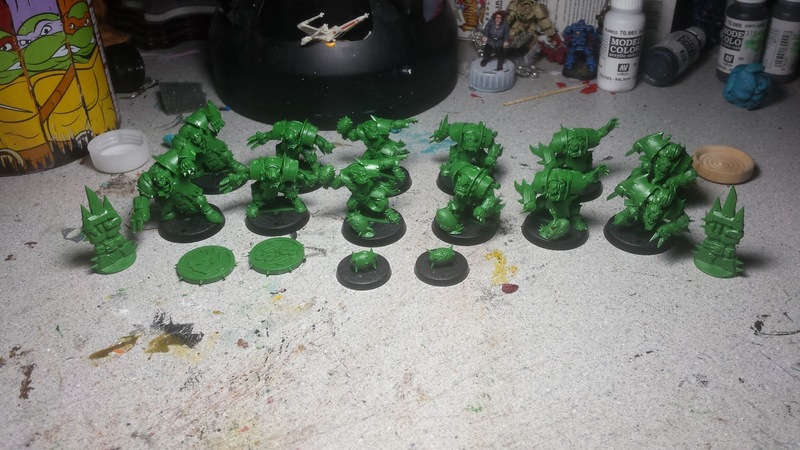 Then I remembered, I also have the Kraken kit from Reaper Miniatures, which I had bought as part of one of their Bones Kickstarters. It comes with part of a sunken ship that is used as the base for the kraken itself and it is a really cool piece. That's when it hit me that she should be standing in front of, or on top of it, and it fits the theme extremely well. Well, the drain of building an army has taken its toll and I needed a break from it. 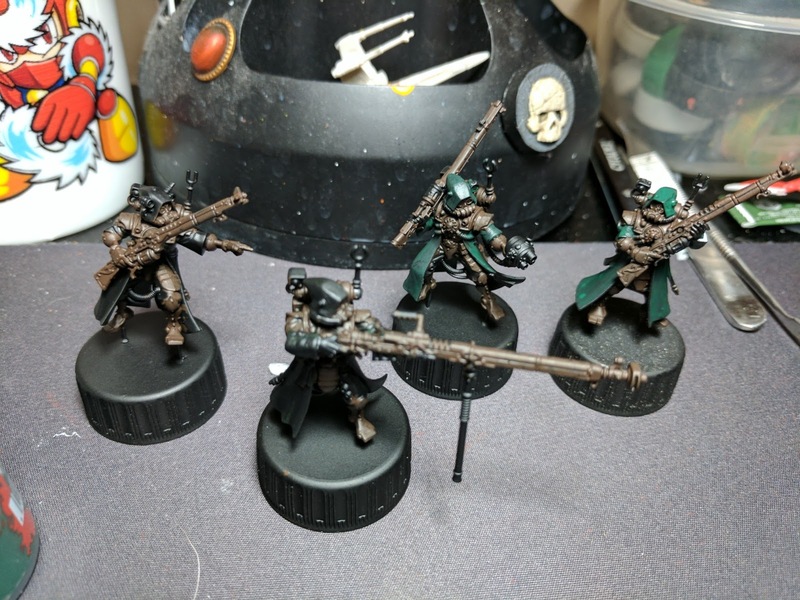 I'd been working on finishing my squad of Skitarii Rangers for what seemed like ages and it was wearing thin. A change of pace was needed, and with that in mind I gathered up the parts for a new display piece. In a bid to get more folks watching us stream miniature painting on Twitch, Sophie and I came up with the idea of having an event where we face off against each other painting miniatures with the Testors' white handled brushes. I believe I originally joked about it once before while we were reminiscing about ye olden days of when we started miniature painting and then in usual Sophie fashion she made it better by suggesting we get drunk while doing it. The idea kept getting kicked around for awhile and we would keep saying "we really should do that", but either of us brought the brushes or made any attempt to bring the idea to reality. 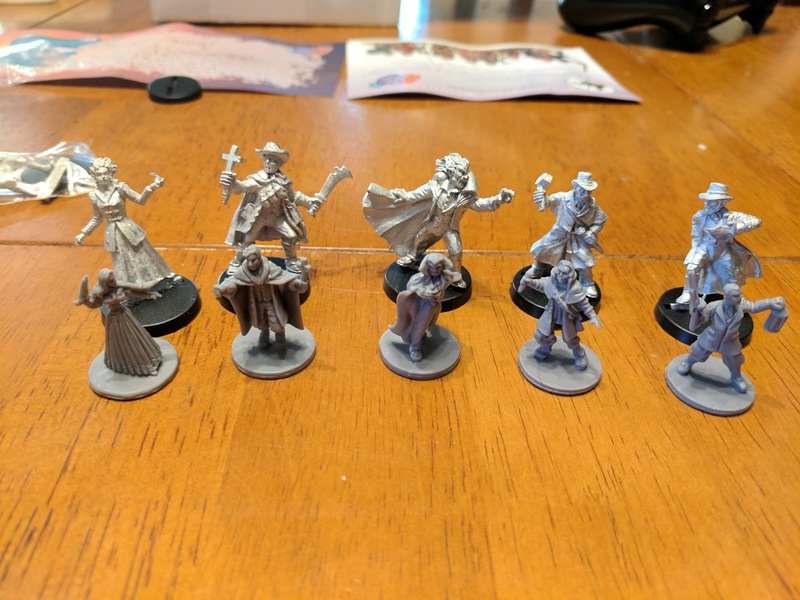 In recent years I've found myself leaving the video game scene and getting more and more into board gaming. I've also always been a big fan of Dracula, and things Dracula related. 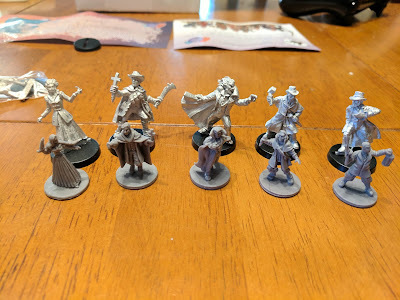 So when I discovered Fury of Dracula from Fantasy Flight Games, it was a no brainer that I was going to enjoy this game. At the time I never bothered to get my own copy, but when Games Workshop and Fantasy Flight ended their licensing agreement, Fury of Dracula quickly became a must buy before it vanished into mist, forever. As of Oct 1st, this little ol' website is five years old! It's a kindergartner! In the early days, all this was was mainly a glorified journal for work in progress projects and the occasional finished piece. In those days I had been only posting on Twitter and wanted somewhere where I could talk at length about the process. I didn't really expect anyone to read it and at times had felt that maybe it was pointless, because who really cares what I think or how I do something. Obviously, someone else has done it before and better, yeah? What's the point of rehashing things that folks can find anywhere else? 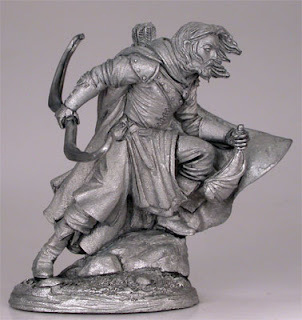 It's no secret RuneQuest is my favorite RPG system, but it is brutal as Hell. Thanks to an unlucky roll while defending an elven forest from chaos, my Storm Bull initiate Talia, lost a leg and was no longer able to travel with the party. After cleansing their forest and making up for mistakes we made against them. The elves joined our cause and agreed cast healing magic on Talia to allow the limb to regrow. The downside, it would take 9 months of in-game time before she could rejoin the party. With that in mind, and since the elves have agreed to join our alliance, we were able to roll up elves as replacement characters for the two characters who were incapacitated. A new character means a new miniature and after a long search trying to find a suitable elf mini, I finally ended up with a human ranger from Dark Sword Miniatures. 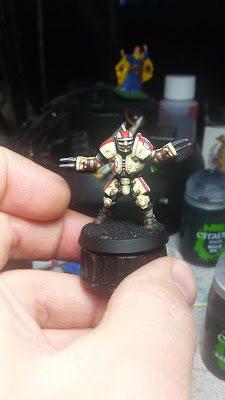 Hey all, earlier I showed you how to paint metal, using silver metallic paint and what I call "High Contrast Metallics". Now, I'm going to show you how to take what we talked about there and use it for copper/brass instead. If you haven't read that tutorial, you may want to check it out before continuing.  Announcing Hobbyistgirl and the Brush Wizard on Twitch! After a couple months of talking about it and figuring out all the details, Sophie and I are starting a Twitch stream! In the time since I last posted about the desk update, I've now added a few more things to it. 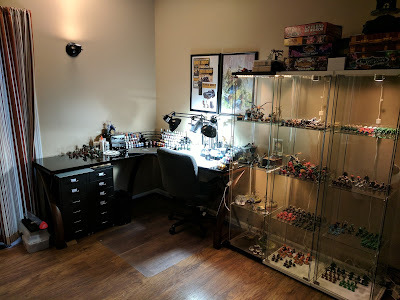 Namely a new paint rack and fresh lighting. This month I have checked off a long time goal. 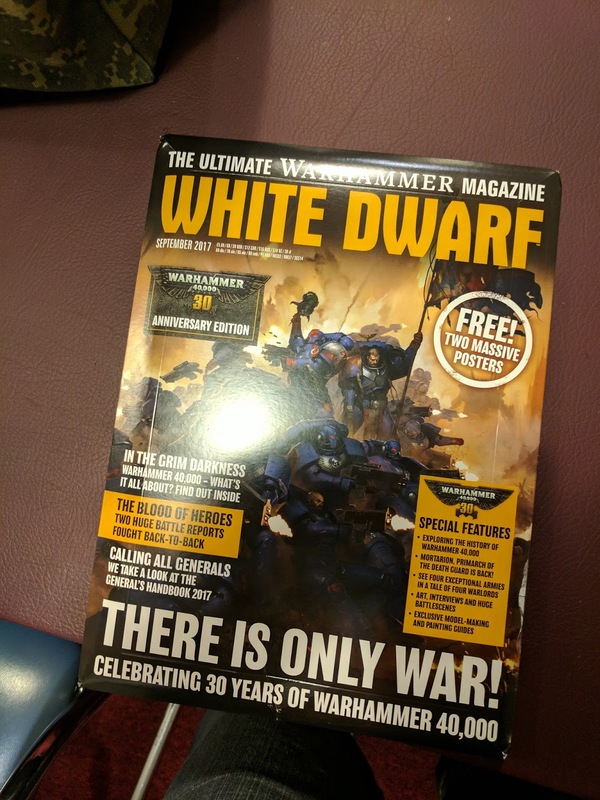 I have a model published in White Dwarf magazine, Games Workshop's official monthly magazine for Warhammer and Warhammer 40,000! The model in question is none other than the Deathwing Terminator Captain that I painted up earlier this year for Adepticon and the Crystal Brush in March. 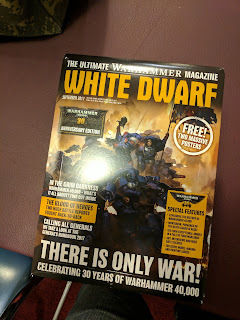 But, apparently this isn't any ol' issue of White Dwarf, its a special 30th anniversary edition, celebrating 30 years of Warhammer 40,000! That's awesome! 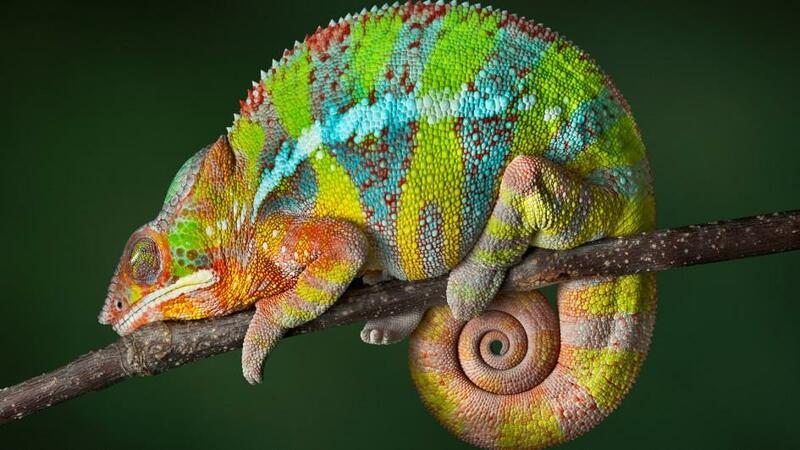 Since Monday evening I've been working on Jon, a chameleon bard, from Panda Cult Games line of Wander miniatures. The official artwork has him with green skin, and originally I was going to follow suit. But then I realized that chameleons can be vibrantly colored and decided to do some image searches for references. That's when I stumbled on this image. 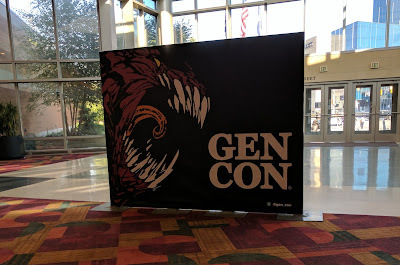 In case you didn't know, I will be attending GenCon this year! It's super exciting and I am both honored and proud to be joining Ninja Division at their booth for the inaugural Golden Kobold chibi painting competition as a judge. You can find me in the exhibit hall at booth #2827, accepting entries for the contest as well as painting adorable chibi figures. This is definitely a dream come true. Not only because I get to go to GenCon for the first time and it's the 50th anniversary, but also because I'll be working directly with the folks responsible for creating and feeding my chibi addiction. I'll be taking as many pictures as possible and when I get home I'll be updating again with pictures and a write up on my experience. This is likely one of the greatest opportunities I've ever had given to me and I'm excited to take part in it and do my part. Th Skitarii train keeps on chugging and I am now working on the five man squad of Rangers. Originally, I had planned on customizing the entire squad with T'au Pathfinder legs. But after totally ruining a few of my original Ranger models, I decided against it. Leaving me with a single crouched sniper in the group. Skitarii. I originally had an idea of making him on a hover saucer, but that idea quickly collapsed when I realized the bits I had on hand were too small to believably carry all the gear the Dominus has. Slightly put off by that revelation, I set it aside and went about other projects. 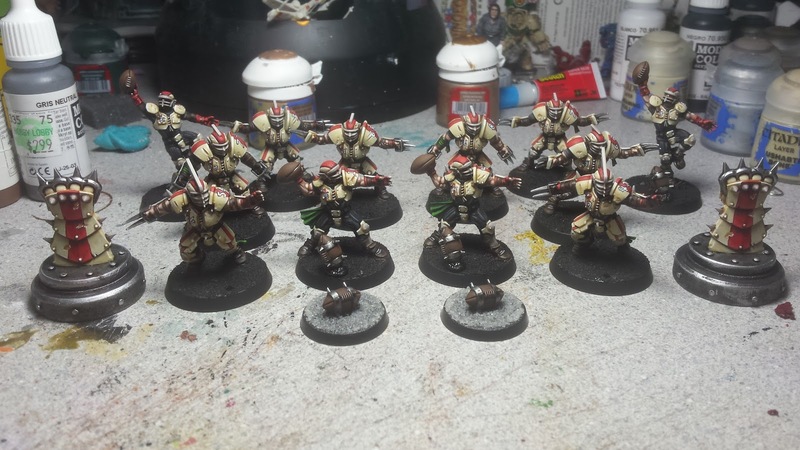 More progress has been made on the Skitarii army for Warhammer 40k. As of last night, I now have the Sydorian Dragoon finished, the first batch of Vanguard weathered, a Tech Priest Enginseer nearly finished, a second Enginseer being custom built and I salvaged my 5 man squad of Rangers. What do bone, gold, brass, copper, leather, rusty metal, mud, and red cloth all have in common? Rhinox Hide, it is quite possibly the most versitile color I've ever used in the current Citadel line of paint. Since it's release, I've found multiple uses for it and emptied half a dozen pots. Well folks, Warhammer 40,000 is now in its 8th edition and thanks to all the hype surrounding it, I am finally painting up my Skitarii models! I've actually gotten some decent progress on them so far and have a full 10 man unit of Skitarri Vanguard finished and I have moved on to a Sydorian Dragoon. "Metal is easy. All you need to do is base coat it, wash and drybrush the highlights and you're done!" Metallic paint sometimes gets some flak for being the easy way out for doing metals. It's also been known to be hard to photograph properly, due to the light reflecting off of the metallic flake in the paint and messing with highlights. As such, Non-Metallic Metals, using regular paint to simulate metal surfaces, has gained popularity recently. Many of the models you see in catalogs, competition and display pieces seem to lean towards NMM as the way to go. 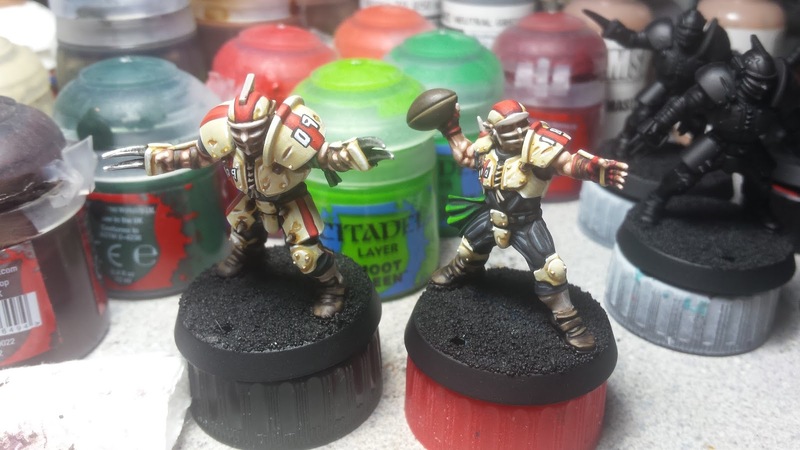 But what if we take the principles of NMM and apply them to metallic paints? This is what High Contrast Metallics is. Using lessons learned from the non-metallic way of doing things and applying them to metals to get a really nice and interesting metal surface using metallic paint. It's something I've been working on for the better part of the year, and now I am ready to share it. A few months ago, I was asked by a friend of mine to do a commission of a "cute mini" for her new desk at work. After looking all over and trying to find something suitable, I showed her the mousling Lara Kraft. A take on Lara Croft of Tomb Raider fame. While talking to my friend Sophie (@hobbyistgirl), she mentioned how she needed chibi in her life. She'd mentioned wanting to get into Super Dungeon Explore, Arcadia Quest or Ninja All-Stars. She also had mentioned buying the box set for Ninja All-Stars a few times. So I decided to surprise her with a model from Ninja All-Stars. Of course, I partially ruined the surprise, because I told her I was painting up a chibi for her. But I didn't show her it while I was working on it (I'm bad at surprises, apparently). The Golden Kobold - The World's First Chibi Miniature Painting Competition! 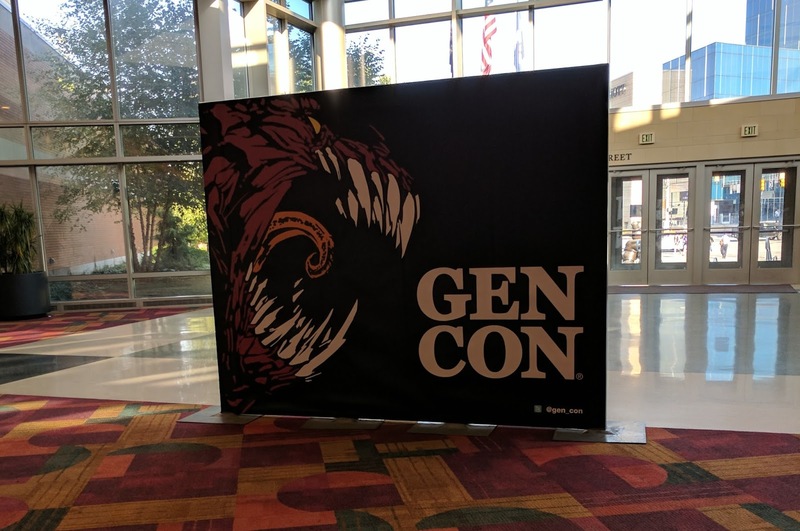 GenCon 2017 is special this year, not only is it the 50th anniversary of GenCon, but it is also the first year for Ninja Division and Soda Pop Miniatures Golden Kobold chibi painting competition! Not only that, but I've been asked to help out with it! Total excitement on multiple levels! I've done a minor update to the Open category. Check it out below. It's been a while since I've posted anything. But I am still doing projects! Currently I'm working on a Warhammer 40,000 Ironclad Dreadnaught for a group army project. This is a Space Marine army based on the Rainbow Warriors chapter of space marines. There's a pretty sizable group of us, some donating models and some donating chair time at the painting desk. I am in the latter group. 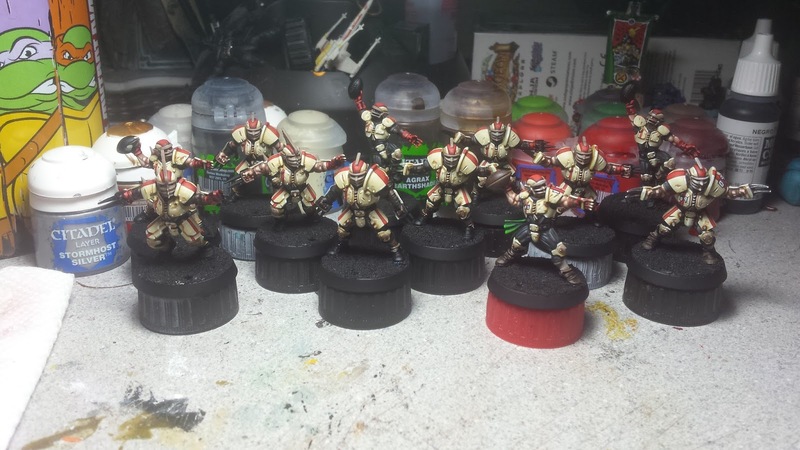 Adepticon 2017 was an excellent experience and I learned a lot about painting competitions and my own painting. In the months before the event, I spent countless hours working on a single entry for the Sci-Fi Single Figure category. That figure was a Deathwing Terminator Captain from Warhammer 40,000. Its been a long time coming, but I'm finally here with write ups on my entries for the Crystal Brush at Adepticon 2017. Following the convention, I hit a hobby rut and everything kind of just stopped. But I'm back and ready to get back on the hobby horse. This is the first of two posts about the models and in it I'll be talking about the Tabbybrook Mage from Super Dungeon Explore. Its time to move on to the base, finally. The first step was painting a freehand portrait of Lion el'Jonson the Primarch of the Dark Angels chapter of space marines. Generally, I don't do a lot of freehand work and I do even less actual paintings. But I have done something similar before in a previous project and had good results, so I thought it'd be worth a shot. The Terminator Captain is now all finished, except for some touch up work and the text on the shoulder scroll. 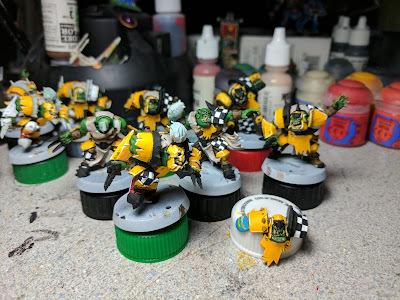 It's been a whirlwind of progress since the last post. I'm not going to try and cover it all. But I'll touch on the big things. As of Thursday night I've gotten the interior of the cape, the rest of the chest details and the custom left arm all painted. It's actually going pretty well and while I know I've got more than 20 hours into the model so far, it doesn't really feel like it. Work took a minor hiatus this weekend, as it seemed like all I did was go out of the house. But as of Monday, I was back to work on the Terminator Captain. I managed to get a lot done since then too, his legs are finished for now. I've since moved on to the torso, which is coming along nicely. Well, in my last post I whined that I couldn't share my progress on any projects that I am taking to Adepticon. Thanks to Greg and his clarification of the rules, I can feel safe in posting my work on this project. 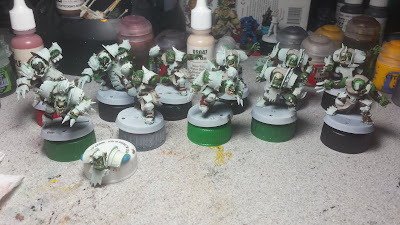 Adepticon is in 42 days and I'm in a flurry of hobby trying to get my entries done for the Crystal Brush competition. It seems like a lot of time, but really it isn't a full 42 days. If I were to work every night right up until go time, its only 210 hours. I'm only planning on entering 2 pieces, one for the Sci-Fi Single Model and Fantasy Single Model. I'm currently working on the Sci-Fi model, which is going to be a Deathwing Terminator, but that's all I can say or show due to the rules of the comp (super lame, right?). I like painting Deathwing but the previous method of painting them, while nice for table top, won't cut it for display level competition. I need more contrast and better highlighting. So with that in mind, I got to work last night on some practice bits.